The world is overrun with undead. Humanity has turned on one another as society collapses. You are one of those lucky few survivors… you have many choices ahead. Will you be a vicious vigilante, plundering and doing whatever it takes to survive? Or will you do your best to preserve civilization, even at the cost of your own life? Take control of your future! Fight the undead and protect what is yours! But before that, make sure you have a plan. Most importantly of all, make sure you test it. Otherwise… YOUR ZOMBIE SURVIVAL PLAN WILL FAIL! The Survivor’s Guide focuses on everything that the players will need to survive! Find the Outbreak: Undead - Gamemaster’s Guide here! Watch We're Alive: Frontier every Wednesday! 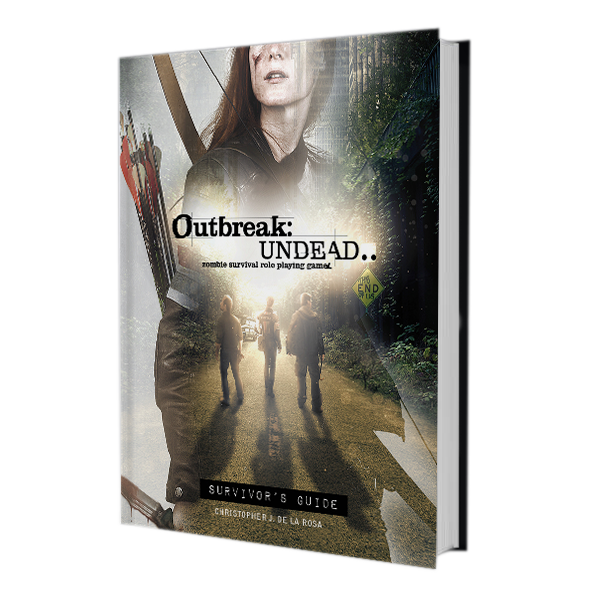 Outbreak: Undead - Survivor’s Guide is co-published with Hunters Entertainment.